In the United States they are preparing to occupy Wall Street, in Spain they will demonstrate at the Stock-Market headquarters, in Greece they plan to boycott banks… What’s going to happen in your city? Posters, banners and promotion material here. 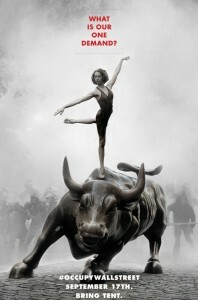 #OCCUPYWALLSTREET in New York, USA – Read the plan of action. #TOMALABOLSA in Madrid, Spain – Read the plan of action, and also a detailed plan in Spanish with the Poster. Fb event. #TOMALABOLSA in Santander, in Spain – Camping 2 days in front of Bank Santander. Read the plan of action. #TOMALABOLSA in Las Palmas, in Spain – Read the plan of action. #OCCUPAZIONEPIAZZAAFFARI in Milan, Italy – Fb event. #OCCUPYBANKOFENGLAND, #UKUncut in London, England – Fb event. other fb event. #USDORSF San Francisco, USA – Read the plan of action. #USDORLosA Los Angeles, USA – Read the plan of action. #OCCUPYWALLSTREET in Austin, USA – Read the plan of action. #OCCUPYWALLSTREET in Seattle, USA – Read the plan of action. #OCCUPYBAYSTREET in Toronto, Canada – Fb event. in Athens, Grece – Hellenic Stock Exchange Fb event. Also gathering in Syntagma square at 12:00 and then march to the Bank of Greece on Panepistimioy Avenue. Fb event. Web flyer here. in Berlin, Germany – Occupy Börse Berlin Fb Event. in Frankfurt, Germany – Occupy Frankfurter Börse Fb Event. in Stuttgart, Germany – Occupy börsenstrasse Fb event. in Lisboa, Portugal – Demonstration in front of Stock-Market headquarters. Fb event. in Porto, Portugal – Demonstration in front of Stock-Market headquarters. Portugal – Fb event. in Viena, Austria – Read the plan of action. in Tel-Aviv, Israel. Demonstration in front of Stock Exchange Headquarters. FB event. Italy – Marches to Rome starts. Follow it in fb. Cambridge, UK – Workshops on the financial crisis. Flyer here.